The aim of Module Cell is to derive raster models by accumulating selected features (min, max, mean, etc.) of a selected input data attribute (z, amplitude, echo width, etc.). Point density: Raster models describing the data density can be derived by counting all points within the raster cells and dividing by the cell area. Point density models are an important tool for documenting the quality of ALS data capture. Blunder detection: Raster models containing the minimum/maximum z-values of the input points per cell can be used for blunder detection (eg. long ranges due to multi-path effects or short ranges due to obstacles within the laser beam). Average estimation: Coarse raster models containing averaged values (eg. the median or mean) are often useful to get a quick first overview about certain data features (simple height models ...). In this sense, rasterizing is a simple thinning strategy. Roughness estimation: Raster models containing the local variability of data feaures can be derived by computing eg. the r.m.s of the input data. This information can be used for subsequent segmentation and/or classification tasks. The ODM administration of additional point attributes is highly extendable. Therefore, the list of possible attributes is only restricted by the availability of the respective information within the ODM. Section OPALS Datamanager contains a complete list of predefined ODM attributes. The basic input for the raster model derivation is an ODM file (parameter inFile). Thus, the import of ALS point cloud data into the ODM is a prerequisite. Please refer to Module Import for more details concerning the import of ALS point cloud data. For each feature, the (aggregated) results are stored in separate raster files (parameter outFile) in GDAL supported data format (parameter outformat). The raster derivation is organized in patches (tiles) internally, thus, maximum performance can be achieved for data formats supporting tile wise storage like GeoTiff or SCOP.RDH. The raster extents are either derived automatically based on the (xy-) extents of input data or can be specified by the user (parameter limit). Furthermore, the dimension of the raster cells (parameter cellSize) have to be specified. Optionally, a value indicating data voids (parameter noData) can be defined. Beside raster files, also OPALS Data Managers (ODMs) may be generated as output files. 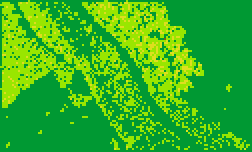 In this case, the result of accumulation within each raster cell is not a single raster pixel value, but a single point. For the "selective" features (min, max, nmin, nmax, center), this is an original point with all its attributes; for the "aggregative" features (range, mean, median, rms, pdens, pcount, minority, majority, quantile, entropy), this is a point just having 3 coordinates: x and y are given by the center of gravity of all points within the cell having a valid value for the selected attribute, whereas z is the respective attribute value as it is derived for a pixel in case of raster output files. By default, the entire ODM contents are used as input data. However, in some cases it is useful to consider only a subset of the data, eg. to derive the point density for all last echoes. For this purpose, OPALS provides a general concept for filtering input data (parameter filter) by passing a Well-Known Text string (WKT). For a detailed description of the WKT filter syntax along with some illustrative examples, please refer to Section Filters. The path(s) to the OPALS data manager(s) whose point data are used to derive the raster model(s) (or output OPALS data manager(s)). In case multiple ODMs are specified, the data are queried from all (potentially overlapping) ODMs. Estimation rule: estimated from inFile, attribute, feature and oFormat in the current directory; in case of one given outFile but several features, the actual output files are estimated from outFile, feature, oFormat. Use GDAL driver names like GTiff, AAIGrid, USGSDEM, SCOP... or ODM. Estimation rule: the output format is estimated based on the extension of the output file (*.tif->GTiff, *.dem->USGSDEM, *.dtm->SCOP..., *.odm->ODM). Text string describing a (tree of) filter(s) using the WKT filter syntax. Value representing an undefined value in the output raster model. Note: The following figures have been generated by applying Module ZColor to the output files (using the default color palette). In this example, a point density map is produced (output: pdens.tif). The file format (GTiff) is estimated from the file extension. The feature pdens (point density) is specified and quadratic cells with a size of 2.0 m are used for accumulation. In this case, the selected attribute is not relevant, because just the number of points per cell (divided by the cell area) determines the result. The extents are determined from the bounding box of the entire ODM point data set. Since all echoes are considered, the regions with multiple echoes (i.e. vegetation) show a higher point density. In this example, two raster models are derived from the amplitude values of the first echoes for the features min and max (output: amplFirst_min.tif and amplFirst_max.tif). The file format (GTiff) is estimated from the file extension. The two output files names are based on the specified outFile and the features. As attribute the amplitude is selected. A filter is specified in such a way that only first echoes are considered. Quadratic cells with a size of 2.0 m are used for accumulation. The extents are determined from the bounding box of the entire ODM point data set. As expected, in vegetated areas, the first-echo-amplitudes tend to be smaller. In this example, two raster models are derived from the echo width values of the first/last echoes for the feature max (output: maxEchoWidthFirst.tif and maxEchoWidthLast.tif). opalsCell -inFile fullwave2.odm -outFile maxEchoWidthBig.tif -attribute EchoWidth -feature max -cel 2.0 -filter "Generic[EchoWidth > 4.5]"
The file format (GTiff) is estimated from the file extension. As attribute the echo width is selected. Filters are specified to select (i) only first echoes, (ii) only last echoes, or (iii) only echoes with a width greater than 4.5ns. Please note that quoting the filter string is necessary in the latter case due to the embedded blanks and special characters. Quadratic cells with a size of 2.0 m are used for accumulation. The extents are determined from the bounding box of the entire ODM point data set. Comparing the two models, one can clearly see that high echo widths are occurring rather at first echoes than at last echoes.